Kona Local Two Tank Advanced Two Tank Long Range Private SCUBA Charter New! SCUBA Packages New! Manta Ray Night Dive Blackwater Night Dive Night Reef Dive New! Two Tank Manta Dive Manta + Blackwater Dive Private SCUBA Charter New! 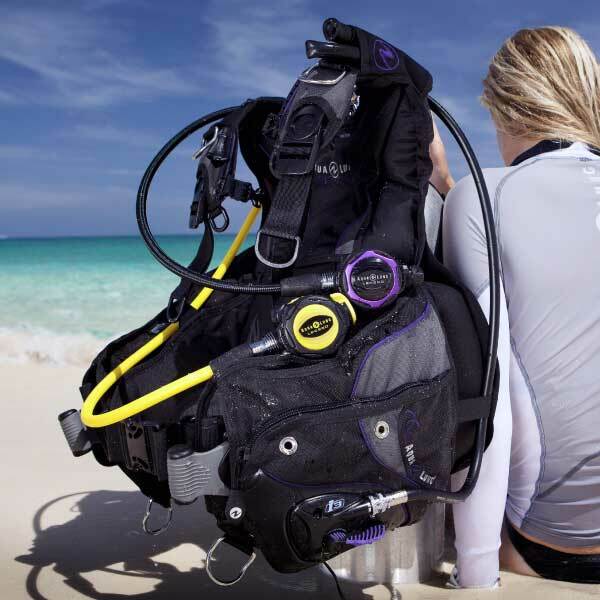 SCUBA Packages New! Gear Rentals Equipment Service GoPro Rental New! Manta Ray Snorkel Dolphin Watch Whale Watch Private Snorkel Charter New! SNUBA Dive New! Discover SCUBA Dive Snorkeling Packages New! See what it's like to breathe underwater on SNUBA. Enjoy life beneath the waves with our guided SNUBA® dive (yes we spelled that right!). No certifications needed with SNUBA® — after a quick safety and equipment lesson you’re ready to explore Kailua-Kona's unique underwater world. Dive up to 20 feet beneath the surface and come face-to-face with dolphins, manta rays, eels, and other sea life. Ages 8+ and the ability to swim is required. Must be able to swim and speak conversational english for safety reasons. Available seven days a week, on request. We include all the equipment necessary. Wear a bathing suit and reef-safe sunscreen. * Not inclusive of tax or gear. Professional snorkel & dive guides, dive lights (for night dives only), snacks, drinks, dry towels, tanks, soft weights, and the best customer service in Hawaii! Please remember to bring dry clothes and a jacket or sweatshirt for night charters, as the ride home can be chilly. All reservations cancelled with at least 48 hours notice will not be charged. Reservations cancelled with less than 48 hours notice will be charged the full cost of the charter, unless Big Island Divers is able to fill the seat(s) on the boat. Lastly, all Charters require a minimum of 3 participants to go. While charters are rarely cancelled due to a lack of participants, Big Island Divers will make every effort to reschedule customers to another day or with another company. SCUBA Diving and snorkeling are physical activities that require you to be able to swim and be in good physical health. If you consider yourself overweight, or have any medical conditions, please consult with your doctor and complete the PADI Medical Waiver. Your doctor can advise you on the safety of these activities given your health. If you are not an avid snorkeler, we suggest you first work on those skills before snorkeling at night on our manta charter, or on our more advanced morning dolphin charter. You will be in the ocean, and divers will be in water up to 40ft of depth. Our dolphin charter is in the open ocean and requires swimming skills. If you are incapable of completing the charter, or we determine that in your and our best interest you do not go or allowed on the charter, we have the right to refuse services and still make applicable charges for the booking, at our discretion. We require that all participants be able to understand and communicate in English for the safety of our other guests and crew. Please be advised that should we feel that we are unable to effectively communicate with a guest, we may not permit the guest to continue on the charter. Manta rays, dolphins, whales, and other marine life are wild creatures and their presence is affected by surf conditions, seasonal changes and the quantity of food in the water. They are wild animals and we cannot guarantee their presence. If you get ‘skunked’ and do not see manta rays, dolphins, or whales on your charter, our ‘No Manta Guarantee’ policy gives you a 50% discount on your next charter with us. We do not offer refunds for charters that do not see manta rays, dolphins, or whales. Divers that have not dove within the last 2 years are strongly encouraged to take a refresher course, however we do not require a refresher to dive with us. Regardless of dive history or experience, we have a 10 minute time limit on your first decent – if you are unable to comfortably descend, we’ll ask you to sit the dive out and consider a refresher. Pricing for refresher courses is the same as adding a private divemaster to your charter – $200 plus the cost of your dives. Our charters can be enjoyed by anyone age 10 and up who feels comfortable with mask, snorkel and the following guidelines (any exceptions require management approval). 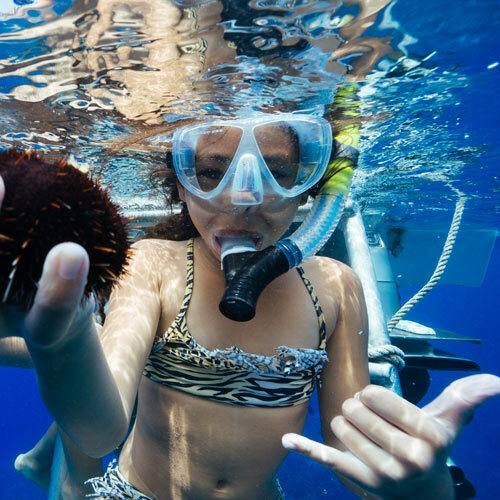 Snorkeling and ride along participants that are under 18 years of age must be under the direct supervision of their parent or guardian on all charters, at all times. Any scuba participant under 18 years of age, must be accompanied while on the vessel by their parent or guardian OR a minimum of 2 BID employees. Our “minor divers” policy is that any diver 10-11 years old must be accompanied by a parent or guardian and have a private divemaster on the charter ($200 per charter). Any Jr. Open Water Divers 10-14 years of age must be accompanied on the charter by their parent or guardian at all times and require a private divemaster or instructor ($100 per charter) at a ratio of no more than 2 divers to 1 divemaster. Any minor under the age of 18 must be accompanied by a parent or guardian at all times. For private charters, we can accommodate guests under the age of 10. Please contact us for more information. Open Water Divers 15-17 years of age require accompaniment by a parent and guardian, or private divemaster or instructor at a ratio of no more than 2 to 1 for the duration of the charter. If they are accompanied by a parent or guardian they may join the regular dive group. If the minor has to leave the regular dive group for any reason, they must be accompanied by their parent or guardian at all times. Sign your snorkel waivers online. 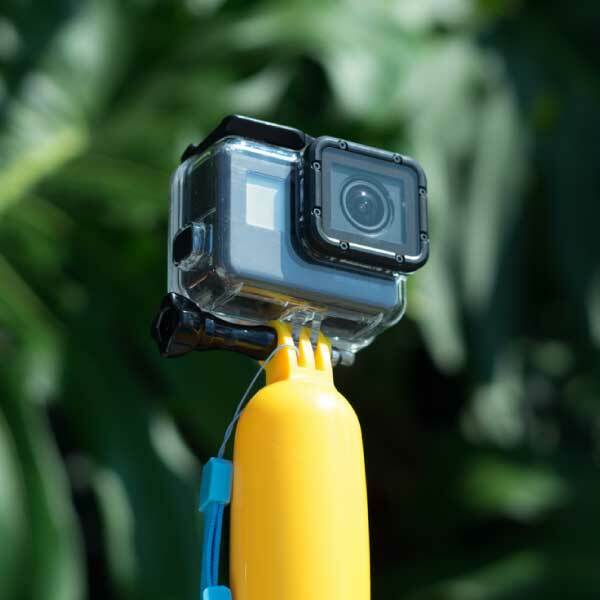 Add-on a GoPro and record photo and video of your dive. Traveling light? Our rental locker has everything you'll need. Not yet SCUBA certified? No worries. See Kona's famous manta rays from the surface on our Manta Night Snorkel Charter. 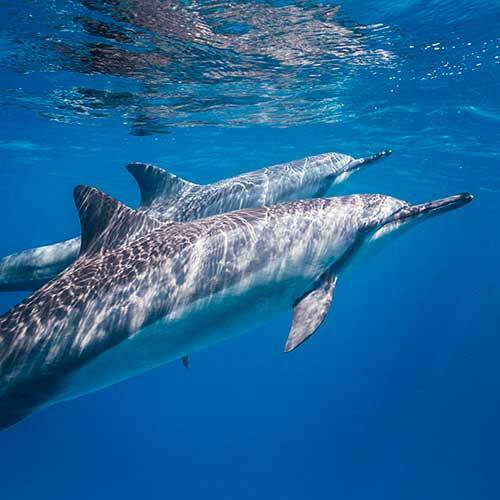 Hawaii is home to many species of dolphin and whale. Join us as we try to spot as many as possible before snorkeling pristine coral reef only accessable from boat. See where Captain Cook first made landfall in Hawaii in historic Kealakekua Bay, a killer snorkeling spot. Bonus: learn some history and Hawaiian lore along the way. Yes! Please use any of the ‘Book Now’ buttons to book online. To book minors, SCUBA instruction, the blackwater charter and our dive packages please give us a call at 808-329-6068. During busy season you'll want to make your reservation as early as possible. Thanksgiving and Christmas bookings usually happen 1-2 months in advance. Busy season is December-Jan and May-August. Our availabilities are visible in real-time on our website - just hit Book Now, or give us a call if you have questions. What's the best time to go diving in Hawaii? All year round! We have excellent wildlife and warm water twelve months of the year. Humpback whales are present in the wintertime. Mantas are visible year-round and are unaffected by season. What's the nearest airport? What about hotels? We're on the west side of the Big Island, so you'll want to fly into Kona International Airport (KOA), not Hilo! We have lots of resorts up and down the coast. You can pick from options in Kona (10-15 minutes away from our shop) or up in Waikoloa (60-90 minutes away from our shop). We like the Kona Sheraton and the Hilton Waikoloa. How long are the charters? Our Morning and Advanced Morning dive charters launch at 8:30am and return to harbor at about 1pm. Our long range charter launches at 7:30am and returns around 2pm. Our Dolphin charter launch at 8am and return around noon. The Manta charter launch time varies seasonally between 4 and 6pm, and returns between 8:30 and 10pm. Blackwater launches between 9 and 10pm and returns around 11:30pm. What should I bring on the boat? For day charters, we recommend sun protection and whatever personal items you need. For night charters, we recommend bringing something warm for the ride home, as it gets chilly when dark. There are dry storage areas on each of our boats. If you’re bringing your own dive gear, our crew will set it up, but we recommend a mesh gear bag to keep everything organized. Cameras are allowed (and encouraged!) and we have freshwater rinse buckets. We ask that you only bring what you need on the boat, as space can be limited. How big are your boats? Do they have bathrooms? We have several boats. Our largest three, the Honu Iki, Kahanuola, and Moana’olapa are each 36’ dive boats that can accommodate up to 18 guests. The Moana’luu is a 28’ dive boat, and the Nai’a is a 27’ RIB for snorkel and whale watch charters. The Iki has a marine head (bathroom). How do I get back on the boat? All of our vessels have marine ladders that you climb to get back on the boat. If you are diving, you may remove your gear in the water and our crew will bring it aboard. On some of our boats, it is required that you remove your gear in the water. May I check in for my charter earlier in the day? Yup! Our shop is open from 8am to 6pm, every day. You can stop by anytime before your charter to check-in. For some morning charters, it is required that you check-in the day before. If you do check in between 10am-1pm, we offer a 10% discount on any merchandise in our retail shop. If I’m staying in Waikoloa how long is the drive to Kona? If you’re staying up north, the drive takes 60-90 minutes, depending on traffic. Certain times of day have particularly bad traffic, and the road to Kona is currently under construction. Please call us if you’re curious what drive time is like from other parts of the island - but note that staying anywhere north of Waikoloa or south of Captain Cook involves driving to elevation that becomes dangerous after SCUBA diving. Plan your dives and lodging accordingly! How long is the boat ride? Depending on which manta dive site we visit, the boat ride ranges from 20-45 minutes. For daytime charters, it depends on the dive site, but usually no more than 45 minutes one-way. Can I check in at the boat, or do I need to come to the dive shop? We require guests check-in at our shop for gear fitting, waivers, directions, etc. Do you rent cameras? Can I bring a camera? We do! Ask us about GoPro rentals when making your booking. We include a 32GB SD card. You are welcome to bring and use your own camera on any of our charters. We ask that when using pole mounts with your underwater camera that you be respectful of sea life and do not touch, harass, or damage any animals or other marine life with your camera equipment. Do you have a photographer I can hire to document my dives? Yes! Let us know if you're interested in having one of our professional photographers join you. Gratuities are greatly appreciated! Most guests leave $25-40 for their hard-working crew. Do you offer transportation / pickup / shuttle service? Unfortunately, we are not able to offer any transportation services between local hotels, our shop, or the harbor. Guests are required to come to the shop to check-in for their charters, we will provide a map to the harbor, and guests will drive themselves up to the road to the harbor for boat launch. The harbor is about 3 miles away from our shop. There are several taxi services in the Kona area, and we recommend Kona Taxicab at (808) 324-4444. The island also has Uber and Lyft, but there are a limited number of drivers. How far out does the boat go? Ocean conditions are unpredictable and can change quickly. Summer months tend bring warmer and calmer waters, while winter months can bring large northerly swells. If your charter is cancelled due to unsafe ocean conditions our staff will make our best efforts to reschedule you. You will not be charged for any charters cancelled by Big Island Divers due to weather. We do not cancel for rain. During the summer months the water warms up to about 80-83 degrees F (26-28C). In the winter months the ocean temperature cools down to 75-77 degrees F (23.5-25C). Most of our guests are comfortable in a 3mm full wetsuit while diving, but we also offer 5mm full suits as well as 3mm springsuits in our rental locker. Even when ocean conditions are flat and calm you may still be susceptible to feelings of seasickness. Being on the water at night tends to make seasickness worse, so we recommend taking anti-motion-sickness meds like Bonine or non-drowsy Dramamine before your charter. We sell Bonine in our shop and have it available on our boats. Can I dive down during the manta ray snorkel? Nope! Snorkelers stay flat on the surface, and divers hug the bottom. We leave the middle of the water column to the manta rays. Freediving with these large animals is prohibited as it interferes with feeding and is potentially harmful to the manta rays. What is the likelihood of seeing mantas? What happens if I don’t see any Mantas? On average, we see manta rays about 80% of the time. They are wild creatures and no guarantees can be made for their presence. Mantas are not affected by the full moon. If you join us on a night where we don’t see any manta rays, we are happy to offer you a 50% discount off of your next manta ray charter. Mantas do not have stingers or barbs. They cannot bite you and they are not poisonous. They are generally harmless creatures who use speed and agility as their primary defense mechanisms. That said, mantas are very large fish (sometimes weighing over 1000 pounds!) and can swim quite fast, so we encourage giving mantas as much space and respect as possible. We absolutely do not allow any touching, chasing, or harassing of the manta rays or any other sea life. Can I do the manta dive if I’m not certified? For the safety and enjoyment of all participants we do not allow any non-certified guests to dive SCUBA for the manta ray night dive. No tour operator in the Kona area allows non-certified individuals to dive with mantas, unless they are breaking dive agency standards. Non-certified guests are welcome to enjoy our manta ray night snorkel experience or to try a discover SCUBA dive on our two tank local morning charter. How long am I in the water with the mantas? Both SCUBA divers and snorkelers will spend about 45 minutes in the water. Can I touch the mantas? Can I touch any wildlife underwater? Manta rays are a protected species in Hawaii and we absolutely do not allow any touching, chasing, or harassing of the manta rays. Dolphins and whales are guarded under the Marine Mammal Protection Act and we only allow passive interaction. This means no chasing, harassing, touching, riding, etc. When in the ocean, it's always best to look but not touch. How long does it take to get SCUBA certified? The in-water portion of the certification process takes 2-3 days. The PADI e-Learning can be done online and may take several days to a few weeks to complete. If you are planning on getting SCUBA certified with us, we recommend having your PADI e-Learning completed prior to being on-island. Please call regarding continuing education classes, as these have different schedules. What certifying agencies to we accept? If you've been certified with PADI, SSI, SDI, NAUI, or any other valid agency, we can take you diving. However, we can only look up PADI and SSI certifications if you do not have your certification card. Please, bring your card! What is the minimum age to get SCUBA certified? You must be 10 years or older to get SCUBA certified. How long do I need to wait before I go over Saddle Road / to Mauna Kea / Volcano Park / on an inter-island flight? Single dives - A minimum pre-flight surface interval of 12 hours is suggested. Repetitive dives and/or multiple day dives - A minimum pre-flight surface interval of 18 hours is suggested. Please note that staying further north than Waikoloa or further south than Captain Cook involves driving to elevation that is not safe after SCUBA diving. Returning to Hilo after a manta ray night dive is NOT possible the same night. Please plan your dives and lodging accordingly! What will I see on the dives / what are the dive sites like? Diving on the Kona coast offers clear water, with 80 to 100 feet of visibility not uncommon. We have a variety of healthy hard corals, as well as many endemic fish that cannot be found anywhere else in the world. The volcanic nature of the island results in unique underwater structures such as walls, pinnacles, archways, and steep ledges. Our Divemasters love to look for eels, nudibranchs, octopus, frogfish, and other varieties of marine life. Where will I be diving? We have over 48 dive sites to choose from along the Kona Coast. The captain and boat crew will choose the dive site choices in the morning based on ocean conditions (current, swell, wind, visibility). The Manta Ray Night Charter and Twilight / Manta Ray Night Charter takes place at Garden Eel Cove (northern Airport site) unless ocean conditions or manta sightings dictate otherwise. If you are diving with us for multiple days, we try to rotate through different dive sites so you can see new things on each dive as long as the conditions of the water are desirable. What if I can't find my dive card? Proof of certification is required for all SCUBA dives - no exceptions. If you cannot find your dive card, we may be able to look up your certification in your dive agency's online database. Please call our shop directly to verify that we are able to locate your certification prior to your arrival. If you do not have your certification card, a photo ID will be required upon check-in or we are not able to allow you to dive. How long are the dives? We do not end the dive with the quickest breather, guests will be allowed to dive their tank until they reach 700psi or a dive time of 70 minutes, whichever comes first. The Manta Ray Night Dive and Black Water Night Dive spend 50 minutes underwater. Can non-divers join me on the dive boat? We group snorkelers and divers together on our manta ray charters, so your group can stick together even if some aren't certified to SCUBA dive. We recommend against ride-along or snorkeler passengers on our morning dive charters, as guests tend to get seasick and bored waiting for SCUBA divers to complete their dives. We offer a variety of morning snorkel charters and can set up a private charter for mixed SCUBA and snorkeler groups. Do your prices include rental gear? Rental gear is extra, and a full set of gear costs $45 per day, plus tax. Wetsuit rentals for snorkelers are $10 per day, plus tax. Mask, snorkel, and fins are included for snorkel charters only. Dive tanks and weights are included for SCUBA activities. Should I bring my dive knife? Are there rules against it? We have no rule against bringing a dive knife. Knives are used for entanglement situations - we do not have kelp forests in Hawaii, but you may want a knife for fishing line. Knives cannot be used to touch marine life and are not a self-defense tool. Can open water certified divers join the advanced charters without an advanced open water (AOW) certification? Yep! As long as they meet the dive prerequisites (e.g. 25 logged dives). Can I dive with mantas while getting my open water certification? What should I do if I’ve never snorkeled before? Can I still go on the manta snorkel, dolphin snorkel, or Kealakekua Bay charter? For your safety, we don't take guests out on the open ocean for our snorkel charters without prior snorkeling and swimming experience. We rent full snorkel packages for you to practice, and there are many places within 15-30 minutes of our dive shop that are ideal for snorkeling practice. Just stop by the shop and we’ll get you set up! What's the minimum age allowed on snorkel charters? We take snorkelers aged 10 and up! We offer private charters for families with younger children. Give us a call to discuss options.